Substances with unpaired electrons are slightly attracted to a magnetic field. This is known as paramagnetism. Air is considered paramagnetic because of the presence of O2 which has 2 unpaired electrons. The Bauer Generator initiates a controlled endothermic reaction that produces a high concentration of air nanobubbles containing the paramagnetic O2 species. 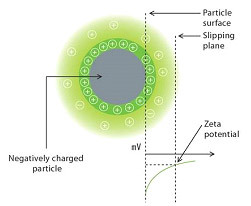 The Zeta Potential is a scale of measurement for determining the degree of repulsion between adjacent, similarly charged, particles in a solution and its measurement is particularly relevant to colloidal (nanoparticle) dispersions. It is a useful indicator for understanding the state of the nanoparticle surface charge and as such, in predicting the long term stability of such dispersions. A high zeta potential will confer stability, i.e., the suspension or dispersion will resist agglomeration. When the potential is low the dispersion will coagulate (i.e. aggregate). Water from the Bauer Nanobubbles Generator can stabilize clay and other particles in water reducing the tendency for aggregation so that they do not settle as soft sludge. The increase in (negative) zeta potential of container walls stops and reverses scalding, thus eliminating biofilm, bio-fouling of membranes and extending the life of filters. surface of a particle suspended in a dispersion medium. What is a Colloidal Dispersion? A colloid is any particle, droplet or bubble having a diameter between about 1 and 1000 nanometers. A colloidal dispersion is a system in which colloidal species are dispersed in a continuous phase of different composition or state. The Bauer cavitation method produces a high concentration of nano size bubbles of oxygen in the treated water. These “colloidal particles” exhibits all the characteristic of a colloidal dispersion and will influence the nature and extent of any interfacial behavior of that bulk water. 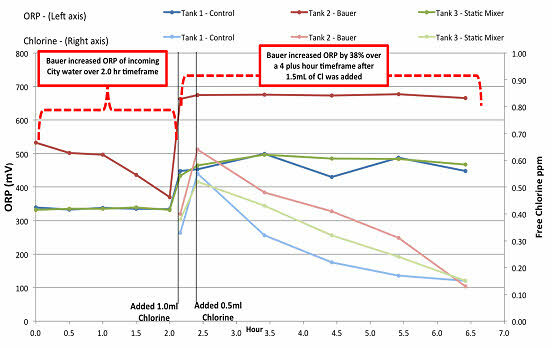 In water monitoring systems, ORP is used as a single-value measure of the disinfection potential of a sterilizing solution. It ranks the activity (strength) of a disinfectant rather than the applied dose. ORP is measured in millivolts (mV) and it is the only practical method to electronically monitor the antimicrobial or sanitizing effectiveness of a chemical control system, whether chemically enhanced or not. The WHO (World Health Organization) has adopted an ORP standard (minimum) for drinking water disinfection of 650mV. The Bauer Nanobubbles Generator increases the efficiency of the sanitizing solution; ORP levels of >650mV are obtained with only small amounts of Sodium Hypochlorite. The increase in efficiency significantly reduces the total amount of chemicals used and results in a more environmentally “green” process. All particles have a “surface charge” in water. Just like “surface area”, it is a fundamental parameter that directly impacts the performance characteristics of any suspension such as surface chemical activity. Surface charge effects are normally negligible for massive solids but they become dominant in the description of colloidal (nanoparticle) behavior. Air bubbles in water are negatively charged. The high concentration of negatively charged paramagnetic oxygen nanobubbles created by the Bauer Nanobubbles Generator has two effects on particles suspended in water. First, it alters the ionic equilibria of any dissolved ionic species in a solution and second, it changes the net charge on a particle surface, both of which directly impact the stability (and ultimate processability) of the particle suspension. What is Bubble Surface Area? Surface area is a fundamental parameter that directly impacts the performance characteristics of any suspensions. The smaller the material, the greater the surface area and surface-to-volume ratio per given mass of material. It is one of the reasons why catalysts perform as they do. Surface area is a very important concept in water treatment and water use. With air bubbles, it strongly influences the rate at which oxygen diffuses from air into water; the greater the surface area, the faster oxygen can move through the surface. (1 cubic centimeter) of water. As the particle size is reduced, the surface area-to-volume ratio per given mass increases – an essential characteristic to all colloidal (nanoparticulate) dispersons. This substantial increase in the interface between air and water provides a much greater contact area for better water sterilization. It impacts the efficiency of chemical reaction with any dissolved or suspended components in the water and enhances aerobic bacterial activity.